According to National Acquired Immunodeficiency Syndrome (AIDS) Control Organization of India, the total number of people living with human immunodeficiency virus (HIV) in India is estimated at 21.17 lakhs in 2015. Children (<15 years) account for 6.54%, while two-fifths (40.5%) of total HIV infections are among females. In Western countries, the transmission of mother-to-child HIV infection has almost been eliminated but not so in India. A large number of pregnant females in India do not seek HIV testing due to social stigma. Annual pregnancy rate in India is 27 million, of which only half attend health services and even less than half of those get tested for HIV. Furthermore, delayed infant diagnosis, lack of pediatric drug formulations, and lack of skilled personnel in Indian settings have contributed to poor control of pediatric HIV. Ocular involvement in children with HIV AIDS differs from that in adults. The common anterior segment manifestations include allergic conjunctivitis, herpes zoster ophthalmicus, dry eye, hordeolum, molluscum contagiosum, and blepharitis. Common posterior segment manifestations include retinal vasculitis, cytomegalovirus (CMV) retinitis, and isolated cotton wool spots. To assess the various ocular involvements in Indian population of pediatric HIV patients, we conducted a study at a tertiary care hospital. This was a noncomparative, prospective, descriptive, cross-sectional, single-institution study conducted at a tertiary care hospital from January 2015 to December 2015. Ethical approval was obtained from the Ethics Committee of our institute. All patients of up to 12 years of age, affected with HIV/AIDS, attending antiretroviral therapy (ART) center of the institute between January 2015 and December 2015, were planned for a thorough examination for ocular involvement. Basic socioeconomic and demographic data were also collected after brief interview with the parents or caretakers. Written informed consent was taken from the parents or caretakers of all the children included in the study. Only those children were included in the study whose parents or caretakers gave informed consent. The sample size was calculated using the formula for prevalence studies. We assumed a 35% incidence of eye disorders among 750 pediatric HIV/AIDs patients over a 1-year period, with a precision of 5% and 95% confidence limit. Preliminary history which includes blurring of vision, deviation of eyes, night blindness, or any other ocular complaints was documented. Detailed ocular examination was done beginning with visual acuity assessment appropriate for age and extraocular movements. Patients were then dilated with eye drop cyclopentolate 2% for three times every 5 min and were examined after ½ h. Detailed slit-lamp biomicroscopy was done to assess any anterior segment involvement followed by indirect and direct ophthalmoscopic examination to rule out any fundal changes. Retinoscopy was done if required. Patient's ART case sheet was also referenced to know about any systemic conditions such as tuberculosis, pneumocystis pneumonia, and Kaposi's sarcoma. Documentation of the patients' most recent CD4 count was done. A total of 506 children were examined aging from 1 year to 12 years, of which 325 were boys and 181 were girls. The mean age of children examined was 8 years. Out of 506 children, 140 were found to have ocular involvement, that is 27.6% of study population. Sixty-five percent of patients with ocular involvement were on ART, whereas 88% of patients without ocular involvement were on ART. 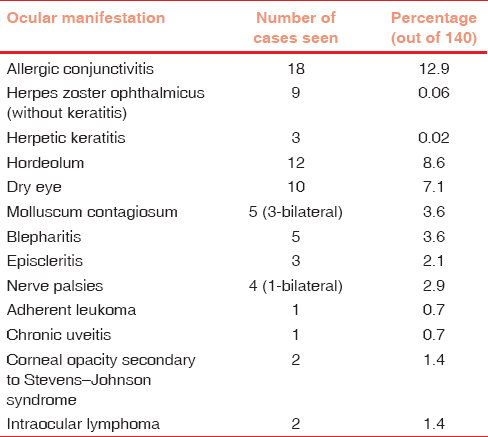 A total of 75 children out of 140 (53.6%) were found to have anterior segment manifestations [Table 1], the most common being allergic keratoconjunctivitis found in 18 children (all bilateral), followed by hordeolum (12 cases) and herpes zoster ophthalmicus (12 cases). 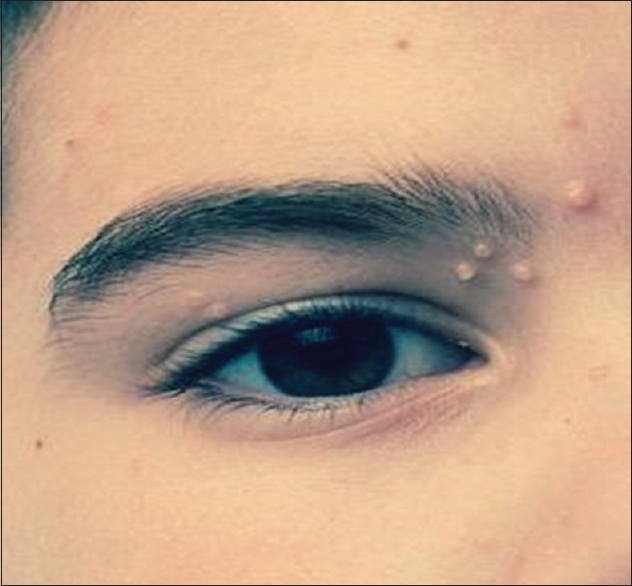 Dry eye was found in 10 children, molluscum contagiosum in 5 cases (3-bilateral) [Figure 1], and blepharitis in 5 children. A total of 58 children out of 140 (41.4%) were found to have posterior segment manifestations [Table 2], the most common being retinal perivasculitis found in 24 children (17.1%), bilateral involvement in 18, and unilateral involvement in 6. Perivasculitis was more common in periphery and characterized by white sheathing of vessels (veins commonly), sometimes associated with hemorrhages. Other posterior segment findings included CMV retinitis found in five children (3.6%). Two had bilateral involvement. Five children showed toxoplasma lesions on fundus examination [Figure 2]. We found 7 childrens with isolated cotton wool spots [Figure 3] on retinal examination. Optic nerve involvement in the form of optic neuritis (2 cases) and disc edema (3 cases) was also observed. Seven children showed refractive errors (5%), of which two had myopia of >8 D, two were hyperopes, and three had significant astigmatism. The mean CD4 count of patients with ocular involvement was 424. The mean CD4 count of patients without any ocular involvement was 865. Using Chi-square test, significant association (P< 0.05) was found between lower CD4 counts (<200) and ocular involvement [Table 3]. With the advent of highly active ART, the prevalence of ocular morbidity in pediatric HIV patients has reduced considerably. Furthermore, the incidence of ocular diseases is more in adults as compared to children. The prevalence of ocular manifestations in pediatric patients with HIV in our study was found to be 27.6%. Kestelyn et al. found 54% prevalence in their study in Rwanda. Ikoona et al. reported 35% prevalence in Uganda pediatric population in their study in 2003. Almeida studied ocular morbidity in South Brazil pediatric population in 2007 and reported the prevalence to be 19.8%. Among Indian pediatric patients, Biswas et al. in their study reported that the spectrum of ocular lesions in children with HIV infection is different from that seen in adults. 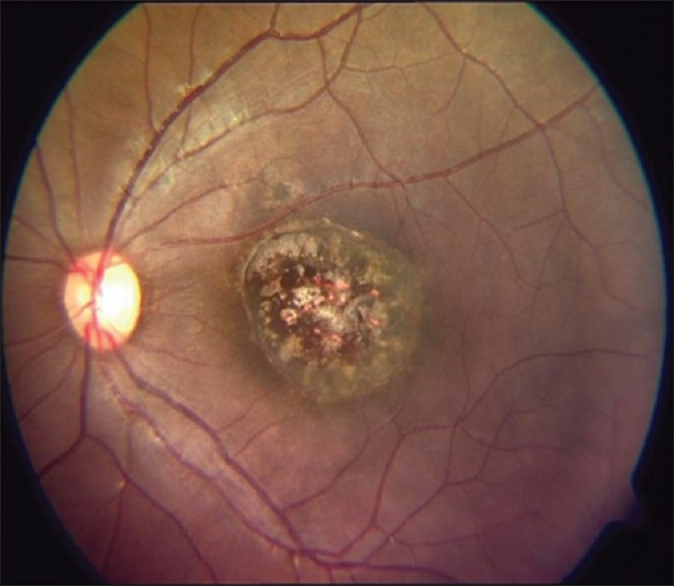 Ocular lesions were found in 50% of patients, the most common ocular lesions being anterior uveitis and CMV retinitis (33% each), followed by retinal detachment (16.66%) and vitreous hemorrhage (16.66%). In another study of pediatric HIV population in India by Singh, the prevalence of ocular morbidity was estimated to be 15.6%. Such high prevalence of ocular morbidity in pediatric HIV patients warrants routine and prompt ophthalmological examination and extreme vigilance on the part of patient's caretakers and concerned ART center personnel. Anterior segment findings were found in 14.8%, whereas retinal and optic nerve findings were found in 12.45% of patients. Biswas et al. 's study found anterior segment findings in 50% of the study population and posterior segment involvement in 25%. Singh in her study found 3.3% anterior segment involvement and 12.2% posterior segment involvement. Retinal perivasculitis was the most common ocular finding overall (17.1%) followed by allergic conjunctivitis (12.9%) in our study. Ikoona et al. reported retinal perivasculitis in 31% of patients. Kestelyn et al. 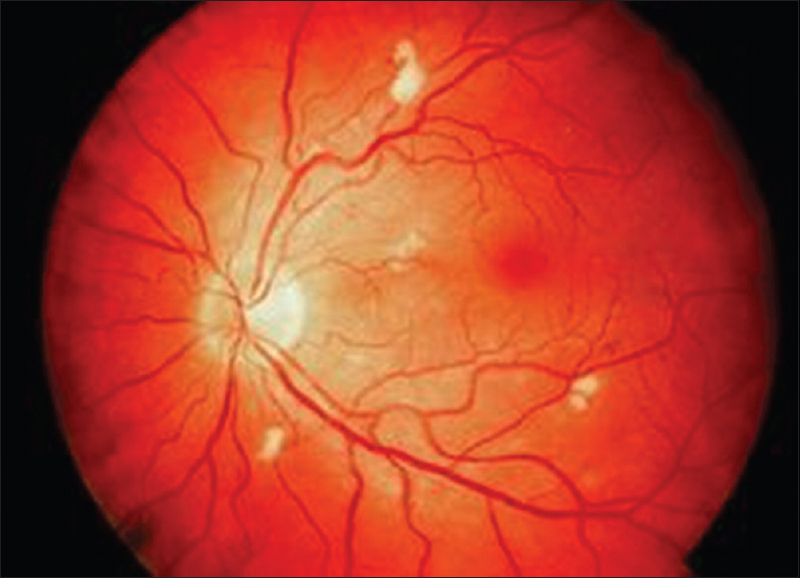 reported retinal perivasculitis in 38% of children. We found CMV retinitis in five children, two with bilateral involvement. Biswas et al. found four cases of CMV retinitis. No cases of CMV retinitis were reported by Singh. Kestelyn et al. found CMV retinitis in three patients out of 162. Ikoona et al. reported CMV retinitis in only 4% of the patients. All the above studies indicate that incidence of CMV retinitis in children with HIV AIDS is less as compared to adults. Ocular manifestations were also correlated with the CD4 count of the patients which showed that lower CD4 counts are significantly associated with increased ocular involvement. Furthermore patients with lower CD4 counts showed more vision-threatening infections; therefore, such high-risk children should be regularly referred to an ophthalmologist to undergo thorough ocular examination. Our study concludes that the most common ocular manifestations in pediatric HIV patients include retinal perivasculitis, allergic conjunctivitis, herpes zoster ophthalmicus, and dry eye. Our study also demonstrates that ocular involvement is significantly associated with lower CD4 counts. India HIV Estimations 2015- Technical Report. National AIDS Control Organization. 10-11,14. Dennehy PJ, Warman R, Flynn JT, Scott GB, Mastrucci MT. Ocular manifestations in pediatric patients with acquired immunodeficiency syndrome. Arch Ophthalmol 1989;107:978-82. 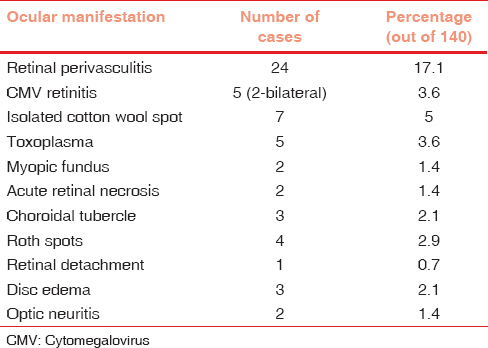 Kestelyn P, Lepage P, Karita E, Van de Perre P. Ocular manifestations of infection with the human immunodeficiency virus in an African pediatric population. Ocul Immunol Inflamm 2000;8:263-73. Ikoona E, Kalyesubula I, Kawuma M. Ocular manifestations in paediatric HIV/AIDS patients in Mulago hospital, Uganda. Afr Health Sci 2003;3:83-6. Almeida FP, Paula JS, Martins MC, Sena DF, Cervi MC, Rodrigues ML, et al. Ocular manifestations in pediatric patients with HIV infection in the post-HAART era in Southern Brazil. Eye (Lond) 2007;21:1017-8. Biswas J, Kumar AA, George AE, Madhavan HN, Kumarasamy N, Mothi SN, et al. Ocular and systemic lesions in children with HIV. Indian J Pediatr 2000;67:721-4. Singh A. Ophthalmic manifestations in pediatric HIV positive patients in Indian. International Conference on HIV/AIDS, STDs, & STIs Holiday Inn Orlando International Airport. Orlando, FL, USA; 24-25 October, 2013.